I do not have a lot of spare time for giving myself manicures or spare time in general! When I saw this NYC One Minute Quick Dry nail polish at Target for $2.50 and thought I would give it a try. The color is Mulberry Street, it is a pale pink with a metallic sheen. I painted my nails this morning at 6 am. I liked the consistency of the polish, not too thin or think. I painted 2 coats of polish. I did not use a top coat. From past experiences with quick dry polishes, I waited more than 1 minute, about 10 before attempting to do more than drink my coffee and check emails. Twelve hours later, the polish held up pretty well, considering the lack of topcoat and after a day of teaching, playing with my son, and doing some dishes! 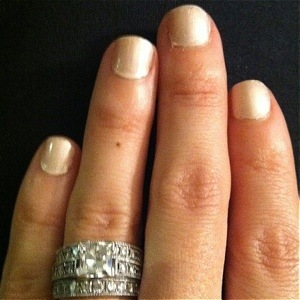 I would recommend NYC one Minute Quick Dry nail polish! Use a top coat for a longer lasting look and expect a good 10 minutes before your nails dry.